... and The Snowman in Piccadilly! 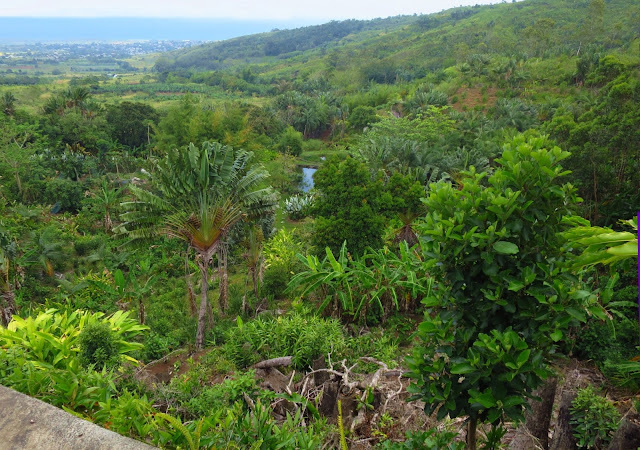 So, to keep the warmth going, I'd like to show you some photos of a wonderful private garden that I visited in the South of Mauritius. It was created from 15 acres of an old sugar cane plantation, and here below is the view from the terrace that overlooks the garden. You can walk down through the gardens and around the lake, or linger in a thatched summerhouse, and there are so many different plants and different views. It was a peaceful, somewhat cloudy day, so not too hot ...and it felt like paradise on earth. I spent a lot of time trying to photograph some maroon insects like large dragonflies on the lake, but they always eluded me. 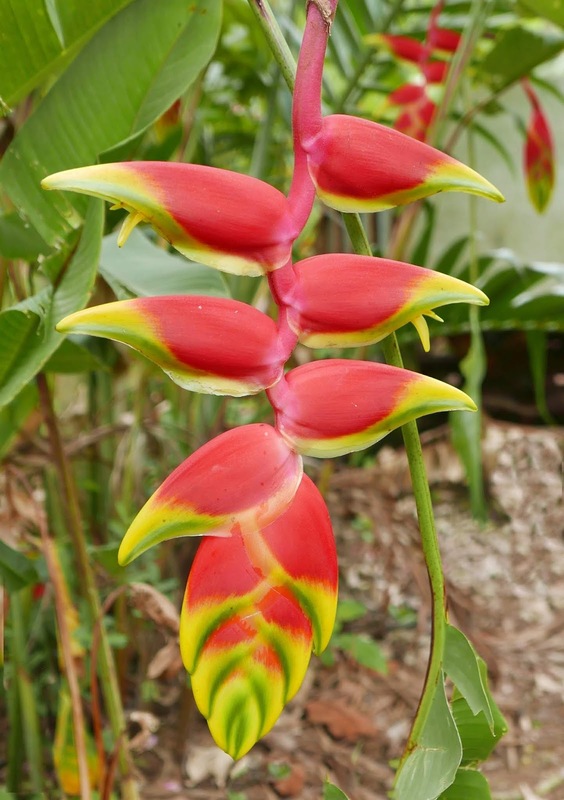 Many of the plants in the garden are tall and have huge flowers, and the garden's particularly well stocked with varieties from the Heliconia (Bird of Paradise Flower) genus. These flashy colours remind me of a parrot. This deep pink and purple bloom is slimmer and more elegant. 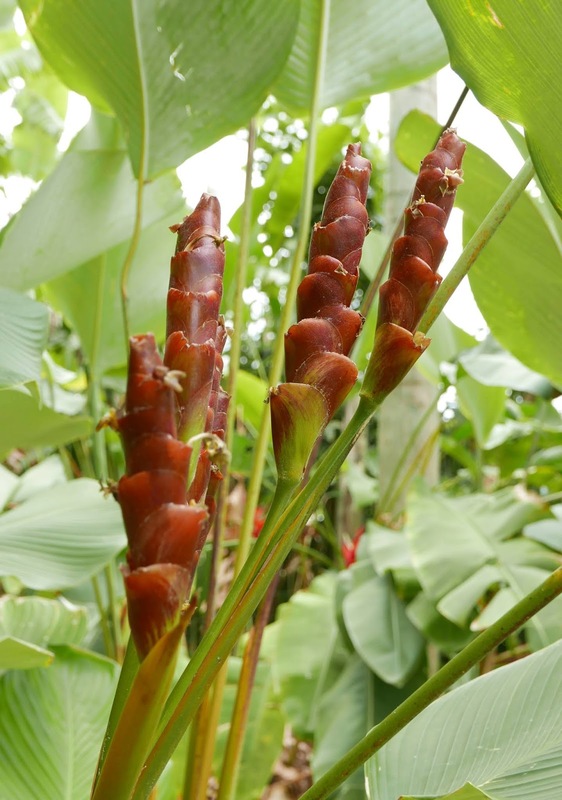 This is sometimes called the "cigar" heliconia. It's supposed to look like a cigar, with the leaves wrapped round and round. Not sure I agree that it does, but it is an imposing bloom that looks good in flower arrangements. And the purplish-blue and cream one shown below, grew about ten feet high - a very striking plant. Sorry it's not a very good photo. The flowers are slightly past their best, but I put it in because I could so easily imagine them turning into giant, crested, long-beaked birds at night. Then T and I went back home with our friends and had a snack of rotis, popular Mauritian street food. Here is a typical roti stall - this one is in a market. The rotis resemble tortillas and are freshly cooked, and often filled with either a mild fish, meat or octopus curry, plus some pumpkin curry, plus red beans and two or three chutneys, which might be very hot. Really delicious! The markets were fun, with local people bringing in produce from their smallholdings. I bought some bitter gourds, and although they were extremely decorative, with that fabulously intricate rind and big orange seeds inside, they looked better than they tasted. 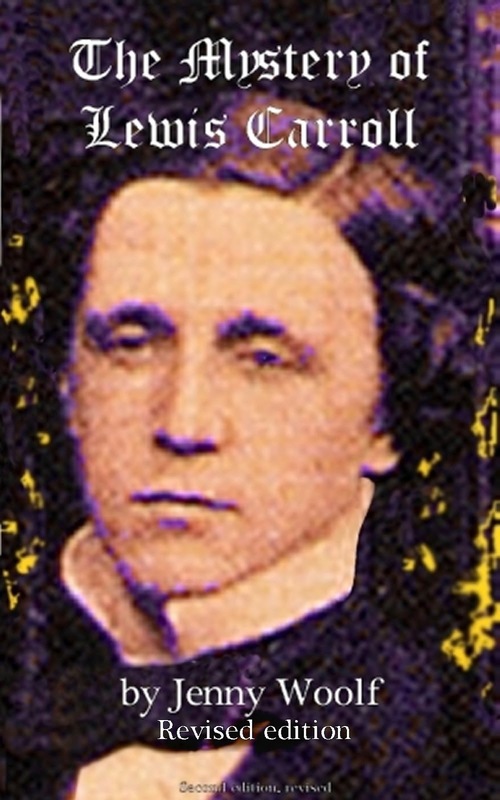 The bitterness comes from quinine. In order to make them edible, you must cut them open, remove the inner pith and the seeds, and soak them in brine for quite a while, then fry them. By that time, it seems to me they taste basically like salt, but they're supposed to be good for various illnesses. 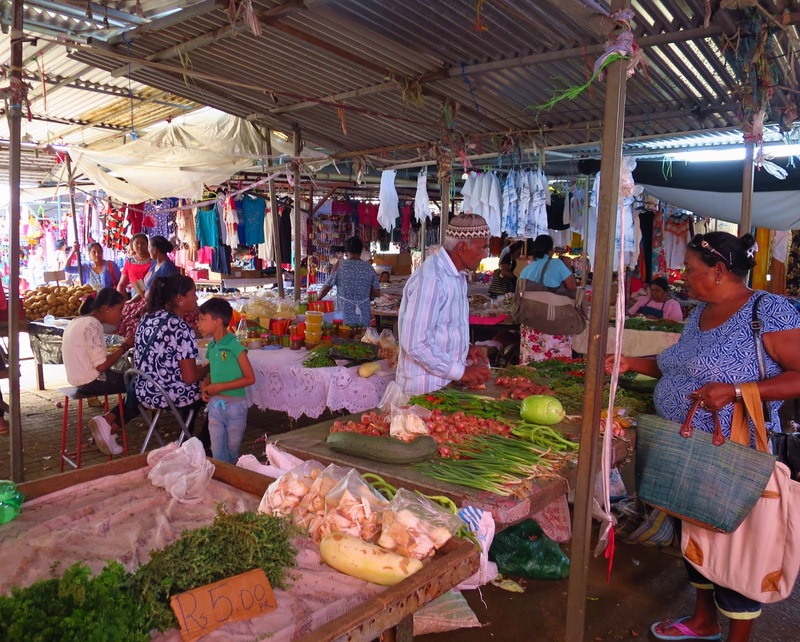 This is where I bought them - it's a large market which we visited a couple of times, and it's at Mahebourg, on the south eastern coast of Mauritius. These pineapples shown below reminded me of pineapples I've had in Hawaii, and might as well be a different species from the acid, under-ripe and fibrous things you so often get in our supermarkets. 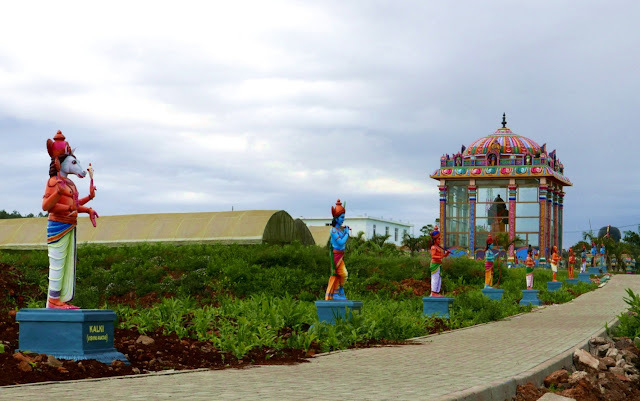 I might have mentioned that Mauritius is over 60 percent Hindu, so you might glimpse a brilliantly coloured Hindu religious building pretty well anywhere you go. I snapped this view from the car. If I lived in a Hindu area I would probably think it looked ordinary but since I'm unfamiliar with Hindu structures, their colour and variety surprised me every time. As the official language of Mauritius is English, you might be able to see that these gods are named and explained on their plinths in English and not in Hindi. I mentioned in another post that Maurituis has some fun buses. Here's one I liked - I came across it after taking a wrong turning near Mahebourg. Look underneath and you'll see a dog, apparently guarding it - or at least, it got up and barked at me as I took this photo, so I reckon it thought it was being a guard dog! 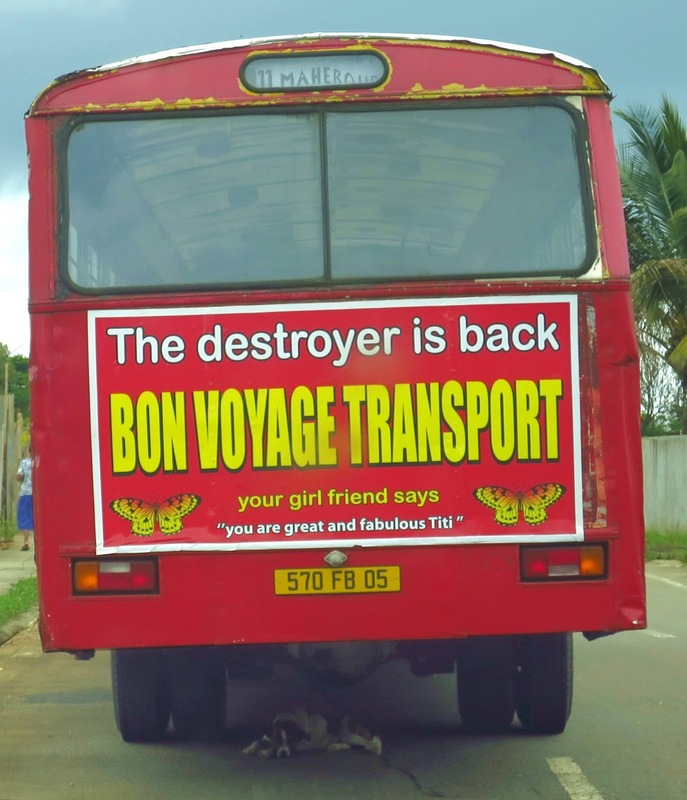 I am not really sure I'd want to ride on a Destroyer bus, but then, Mauritian bus drivers seem to have a reputation for being rather fiery characters. As well as the always-interesting buses, I liked that there were so many bright and, to me, unfamiliar plants growing outside houses or scrambling over wasteland. Does anyone know what the flower below is? I'd love to try and grow it at home. It is like a cross between a convulvulus and a sweet pea. And below is one of the photos which I like the very best. I like it because it shows just what I imagined I would see in Mauritius. And when I took it, it felt amazing to be moving quietly through so much blue, knowing that the ocean stretched out there for hundreds of miles beyond the reef. Beautiful photos. The variety of colors in Nature there are mre beautiful against that ocean. As snow flurries fight with the sun outside I am loving your warm photos. Evocative sentence, I can imagine it! Your header photo quite fabulous ! Love the Christmas decorations, make me very happy. Thank you very much for this Rosemary.I have only just got to answer comments on this post but if you are reading this I thought I'd say I bought some - thanks for the tip. Thank you Rita. 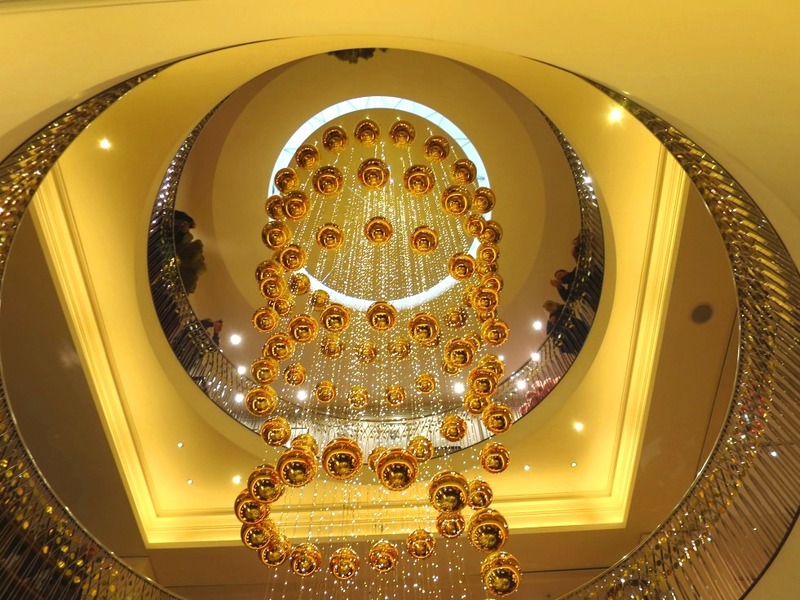 Yes, Fortnum and Masons know how to do Christmas decoration, sometimes I spend an hour or two just wandering round the store and looking at them. It must be quite a shock to the system to be there with the warmth and lush growth and suddenly land where it's winter. Keep warm! Very much so. To be strictly honest it was a little TOO warm for me there, but it was still a shock to come back and see all the Christmas stuff. Thank you for providing some much-needed Mauritius warmth. It snowed here in Tennessee yesterday and tonight (as I write this) it's really frigid. Your floral photos are lovely and I'd like to try some pumpkin curry (I'll stay away from the octopus....). I've never seen pineapples like those. I must be used to the fibrous supermarket species. By the way, I like the header photo! The pumpkin curry needs quite a lot of spice. I've never been a big fan of pumpkin but it goes well with very hot chutneys. It has been sunny here most of yesterday, but is grey today with finally some of that much needed rain. Looking at pictures of sunny Mauritius is quite the opposite of what I see from my kitchen window today! I can never quite come to terms with cooking octopus, they seem among the more intelligent and interesting bits of underwater life. Did you ever see that David Attenborough programme, I think it was, where there was such an amazingly intelligent one? I don't know the name of the flower but I swear I have seen it in the UK. Enjoyed reading this, Jenny. You certainly get to see some fabulous places. Thank you Valerie! I am glad you enjoy them! Markets are some of my favorite sites to visit in unfamiliar places. 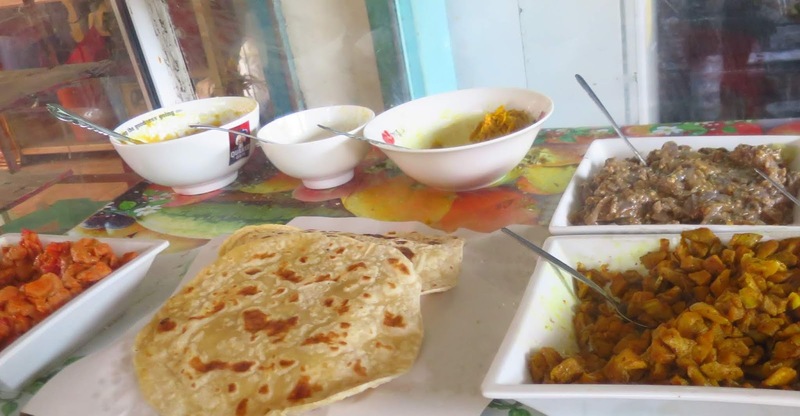 This looks fascinating -- also fascinating, the similarity between some of your descriptions and islands in the Caribbean, where tropical fruits, roti with curry, and fish all seem congruent with what you experienced half way around the globe! Yes, I think roti and curry get everywhere. We have it in our local Indian restaurant but I have never seen it anywhere as actual street food. That might just mean I haven't been to enough places. I spent some of my childhood in Australia and some in western Europe and got thoroughly confused about Christmas, and what you ought to do then! Hello Jenny, Those bitter melons are very common in Taiwan, and people (but not usually children) like the taste, so do not soak or salt them excessively. They even make smoothies out of them, which you can buy from carts on the street. Although I have become used to bitter melon as a vegetable, I have not had the nerve yet to try one as a smoothie. Many Asians who move the the U.S. grow bitter melon in their gardens, knowing this is one vegetable they are not likely to find at the corner grocery. I did not know that the bitter melons were common in Taiwan, Jim. The idea of a smoothie made with one makes my mouth pucker! It seems surprising to me that people like the taste, but then I think how my family and I always love "Marmite" and most people who try it who are not raised to eat it, push it away with a grimace! I love bitter gourds and rotis. thank you for wonderful series of photos. I am glad you liked the photos, thank you very much Tanza! Hello Jenny, I was just reading about Jeanie's visit with you on her blog. What a fun time for blogging friends. I was reading this post and prior posts about your trip to Mauritius, what a beautiful island. I had to google Mauritius to find it's location, that is far for us. I would prefer the tropical weather over our winter. The flowers and fruits are all beautiful. I love the water color and the birds. 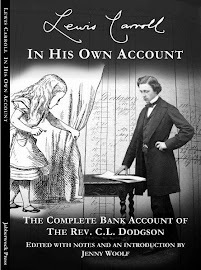 Wonderful post and photos. Have a happy day! Thank you for your comment, Eileen! Jeanie has some nice people who follow her blog. I am glad you enjoyed the Mauritius posts. It's a small place and probably about the opposite side of the world from you (not that I have looked at an actual globe of the world, I'm only guessing! The water is such an amazing colour, I love it too. The food looks so delicious. One of the great things about travel is the opportunity to try new foods, but so many people seem reluctant to give it a try. “English style fish and chips” in Singapore, seems like a bit of an oxymoron to me! I usually eat anything so long as it doesn't have meat or fish. I am less keen on those anyhow but I rarely find a veggie I don't like. I even managed to enjoy the bitter melon in the end! Lovely photos again. Blue sea and blue flowers, great stuff. Thanks, Adullamite. I appreciate praise from you since your own photos are usually so evocative and I always enjoy looking at them. Whoa! So, so beautiful. And again- reminds me of the Mexican Caribbean in many ways. Which is where I'll be spending my Christmas, eating a similar but different sort of food, being enchanted by the water, the flowers, the people. Yes. We have them here in Florida. Aren't they delightful? I've read your latest post at time of writing, and was inspired to look up the location. Sounds like a wonderful part of Mexico and I'll look for more posts after replying to these comments. Hi Jenny, a great post. It definitely must have felt strange for you that sudden shift in climates! Lovely to see some more of your Mauritian adventure. A snack at that market stall would have been fun - spicy :D) What a name for that bus - too good to pass up a photo opp even with a doggie giving you fair warning! It all looks so lush and gorgeous and that clear water is so inviting. Cheers now and enjoy your weekend. So beautiful. And such a contrast to the wintry/holiday scenes at the beginning. What a wonderful trip you had, Jenny...and your photos are fantastic....much appreciated by we, your readers...so thank you. I think if you live somewhere really hot winter is a blessing. Mauritius was just coming out of winter and everyone kept sayihng how nice and cool it was... could have fooled me!!!! Hi to the Happy Snowman in Piccadilly! What lovely tropical flowers you have seen Jenny. 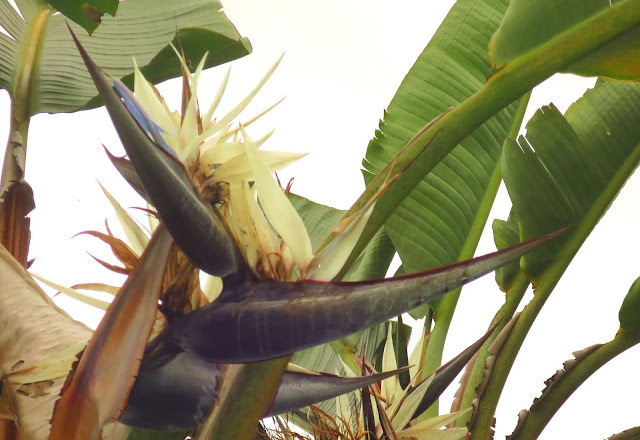 The Bird of Paradise are lovely specimens, different from what I know here in Australia. And the blue flower is intriguing, as you say like a convulvulus, especially the intense colour, and I can see the pea plant there too. Maybe it is a hybrid? The Hindu building and statues are very colourful too, in fact quite joyeous. I can tell those pineapples are delicious, because I always go for the smaller, bright yellow ones too, they are the sweetest. We have too many pale and sour ones in our shops too! The Bird of Paradise flowers our friends grow include some fairly exotic ones that are found in few other places. In fact one had bright green flowers! 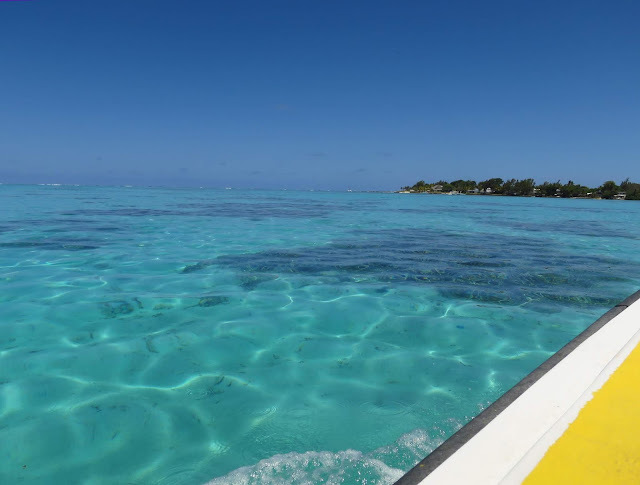 Actually I think the bright colours are some of the things I like the best about Mauritius. Silly me, I just found the comment you left on my blog back in October. I have a year or so of comments to catch up on! You have some fabulous photos here. 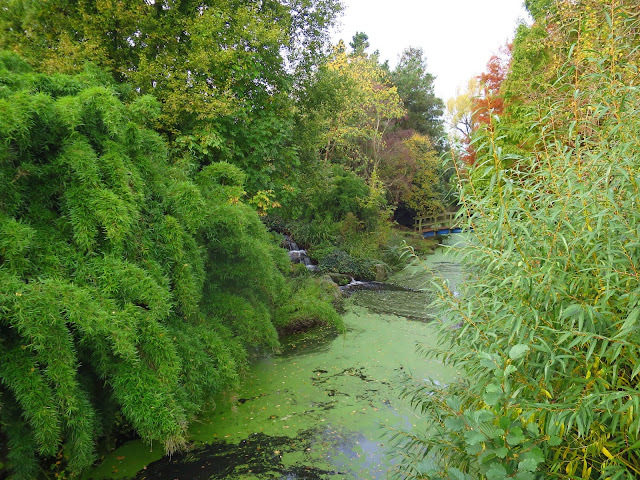 Wow -- it looks so warm and lush! The flowers are spectacular -- wish you could bring some home for your garden. That last blue one reminds me of our morning glories. Love the color! The gourds look similar to some I photographed in a market here, though probably not. I wondered what to do with them -- good to know that if I see them again, I can know what to expect. I know what you mean about missing a month and leaving in one season and returning to another. That sort of happened with us in October -- your fall is later than ours (at least this year) and when we got home, ours was all gone. I love seeing the Christmas things of London -- the stores with Christmas shops within were full fledged in the shop and we saw some things going up over the streets but not the full deal. I'd love to visit in December! I love that Morning Glory blue.We have one on the balcony but it has not done too well in a pot, I think they're a plant that likes to sprawl! Someone else gave me the name though so I'm going to buy some seeds and try to grow some next year. I don't have awfully green fingers but here's hoping! I am not sure December is my favourite month; it can be very cold and rainy ...but at least it doesn't usually snow! The heliconias are amazing. I've never seen them before. Such wonderful colours. The Hindu religious building and figures are interesting. Would you go in to pray, or is it just to house a religious icon? 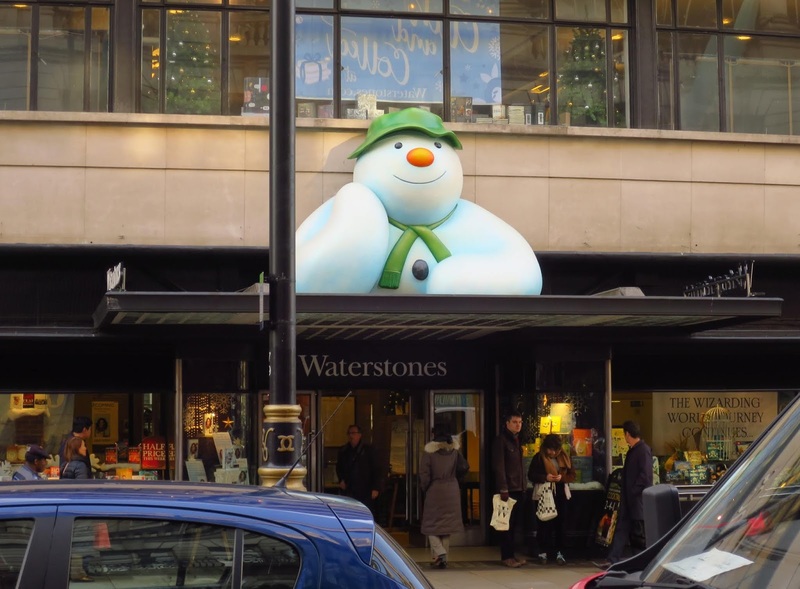 And I love the giant Snowman outside Waterstones! I don't think heliconias grow much in Britain, most are very large so you don't even see them in hothouses. I was pretty unfamiliar with them till our friends began to grow them. I don't know much about Hinduism, but they do leave offerings and pray inside the temples. 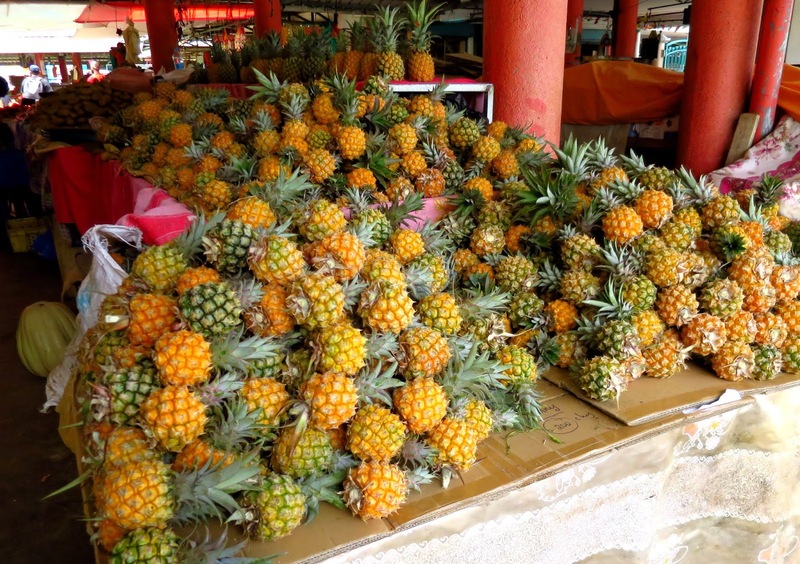 I was oddly fascinated by the pineapples. It's a fruit I eat but to which I have never given any thought. Yes, it is so funny to see the destroyer bus and the dog! The sea and the Sky in the last photo are melting together. Have a good new week, Jenny. Yes, it feels as if they are almost the same, that sea and sky. I am glad you appreciated the picture of the bus and the dog, they both made me smile for slightly different reasons. Thank you Tomoko. Let's enjoy winter days. Happy sunday to you. Winter has its own charm doesn't it? Enjoy your week! Oh my goodness, such a wonderful delightful group of photos and adventures. So happy to see your comment again at my blog too. Enjoy your week ahead. Thanks Karen, I am sorry i am a less frequent commenter, I'm also a less frequent poster although I still enjoy the blog world. I just don't seem to have quite as much time as before. Right now it is minus eighteen here - a tad different from what you were experiencing. Dear Jenny – I didn’t stay in hot climate in November, but my body seems to be confused with the sudden chill after the long warm November. It is said the parasympathetic nerve reacts to warmth while the sympathetic nerve to coldness. . The remembrance of Mauritius brings forth the warmth. Like you, I like the last image of clear, beautiful aqua blue water merging with the azure sky; I can almost hear the sound of the waves and feel warm sea breeze. The plants look so exotic and the rotis with fillings look moreish. “Goya” (bitter gourd) quite looks like the ones harvested in my garden every year. Remember Japan's summer is sub-tropical. I drink Goya shake which is made of thinly sliced goya, milk, and banana. It is a wholesome drink. I’m having a blog break till the New Year. Wish you a lovely Holiday Season. Thank you for your thoughtful comment. The blue skies seem like a far-off dream now! I hope you have a good break - "see" you again in the New Year! Just admiring your photos warmed me up. Thankyou! I can imagine your body missed that, Jenny. It looks to lovely! I too am missing the warmth. The cold has hit us so suddenly. Beautiful photos of a lovely island. I would very much like to go there! Last December we were in Rotterdam and it was very wet, and windy, and then snowy. I hope the weather has been nicer this Christmas. Happy holidays to you! It's -4 C, light snow and darkness. Jenny, you've been in such paradise, tropical climate. Love your photos especially of Maurituis fun bus and the dog sleeping under it. What an awesome place that makes me pine for pineapples. A wonderful post, as always. Love the photos. Thank you for this and for your supportive kindness. Ooh that lovely blue water. I love the Christmas decoration in Fortum & Masons. It shows you what blue can be. I never know why it's used as the colour for feeling sad! Just came to see the cake baking post (I've used the Cranks recipe in the past.. very tasty). Is the blue flower Morning Glory? Ipomoea ? I'm finally catching up with you and have enjoyed the pictures you posted of Mauritius in this and previous posts! The flower reminds me of a morning glory, too.